To view this Webinar click on ICAT Webinar. From this new page, you will have the option of downloading the Webinar by clicking Download, located in the upper left on the menu bar. Please note that the presentation features many embedded audio clips that may take some seconds to load between slides. 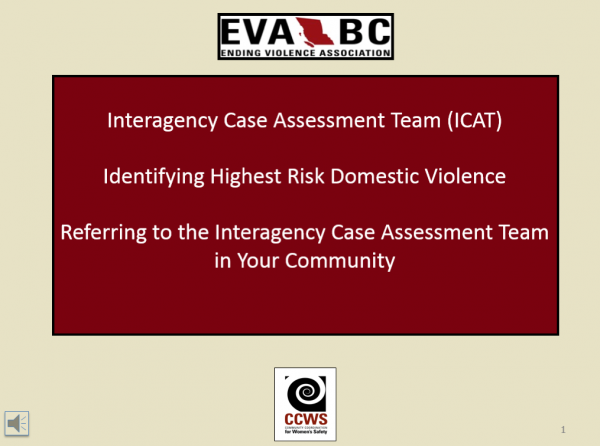 The webinar was produced as a tool for community partners to learn about the ICAT model for addressing highest risk domestic violence and the evidence based factors used to detect lethal violence. The slide presentation is coupled with audio clips of key resource people. We would like to thank our sponsor, the Victim Services and Crime Prevention Division, BC Ministry of Justice.